Unprecedented levels of monsoon rainfall have led to massive flooding in Burma leaving whole regions under water. Many thousands of village people are now homeless and have lost livestock and food supplies. 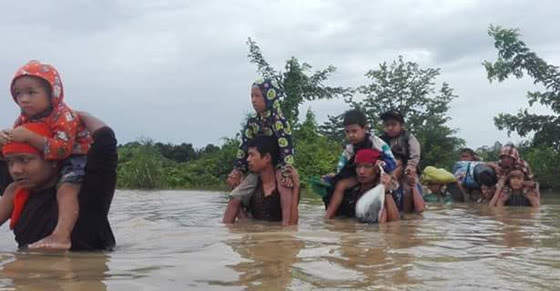 In particular Sagaing and Magwe Divisions near the Pandaw Charity operational base at Pagan are severely affected and the island villages where Pandaw operates Clinics are now under water. As yet the human toll is not known but can only increase with the further risk of disease. To help support the relief effort to remote villages, Pandaw will dispatch the ship KALAY PANDAW next week laden with 100 tons of rice and a full medical team from the Pandaw Clinics. The KALAY with a draft if only 2.5 foot will be able to penetrate inland areas to deliver food and medical aid. Purser Ko Win Hlaing, who masterminded the Pandaw Charity Cyclone Nargis relief operation in 2007, will once again assume command. He masterminded the Pandaw Family Box, containing life essentials, and will work on reviving this again. As with Nargis Pandaw have the ships, team and generous supporters to be able to be first in and last out. Fortunately the Pandaw Charity has a good reserve fund and is able to fund the initial supply of food and medication. The Pandaw charity can move fast but we will need all the help we can get. To donate, please visit www.pandawcharity.com and click through to our online donation page. Thanks for helping the people of Burma. The Pandaw Charity was established following Cyclone Nargis in 2008 when the Pandaw ships, converted to floating hospitals, and their crews saved so many lives. Since then over twelve schools have been built and the UK-registered charity operates seven Pandaw Clinics in middle Burma which provide an average of 5,000 free treatments a month with a full time team of twenty medics, paramedics and pharmacists. This is entirely sponsored by donations from Pandaw passengers and a profit share from Pandaw River Expeditions.